Love your blog. Is there anyway you would could reblog my blog about my apartment, 110 Green Street. I’d like to inform others not to live here and just how crappy the management is here. If not, no hard feelings. Thanks and keep up the good work. As it would happen, I myself have had the pleasure of receiving a photo of the above-depicted bit of gastronomic distress. Here’s one for your blog. 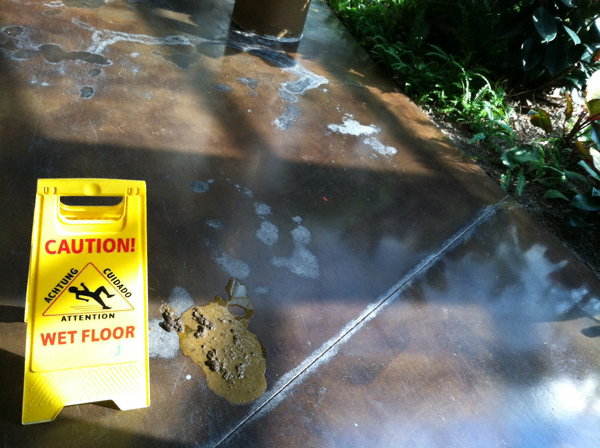 This tasty display of canine explosive diarrhea was discovered in the “lounge” of the Viridian. I’m guessing by the presence of the “Caution!” sign that the dog’s owner has no plans to clean it up. But that’s just the kind of considerate behavior that I’ve come to expect from my neighbors. Here’s another pair of photos this individual has see fit to send yours truly. Along with commentary. 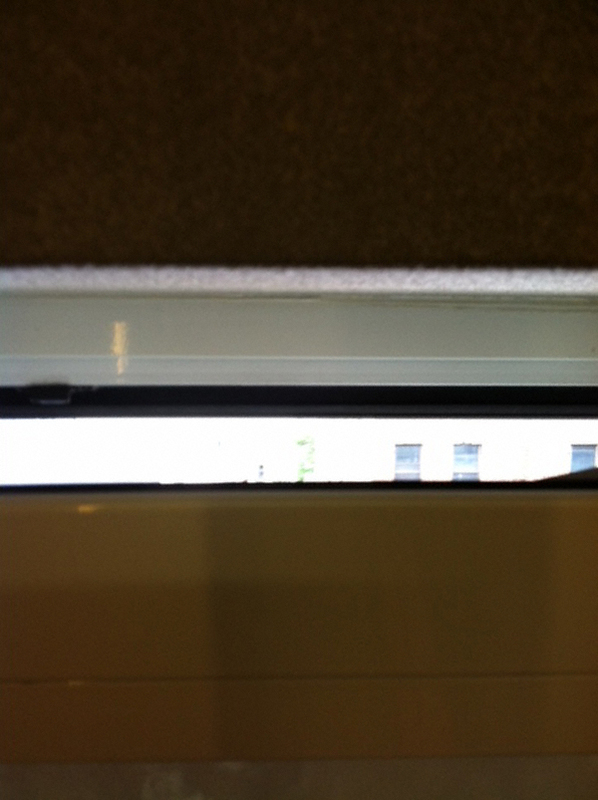 This shows the separation between the window and the wall. The area showing the view across the street is completely open to the outside. It should be noted this person also informed me that following the fireworks/beer tossing incident on July 4th (which resulted in a police helicopter buzzing the area and generally scaring the bejezzus out of folks), the management of this building issued a memo informing tenants of the rules regarding use of the roof (as seen at the beginning of this post) and that surveillance cameras were installed so as to catch anyone using it without permission. These were promptly rendered non-functional. UPDATE, August 12,2012: There appears to two websites dedicated to 110 Green Street. 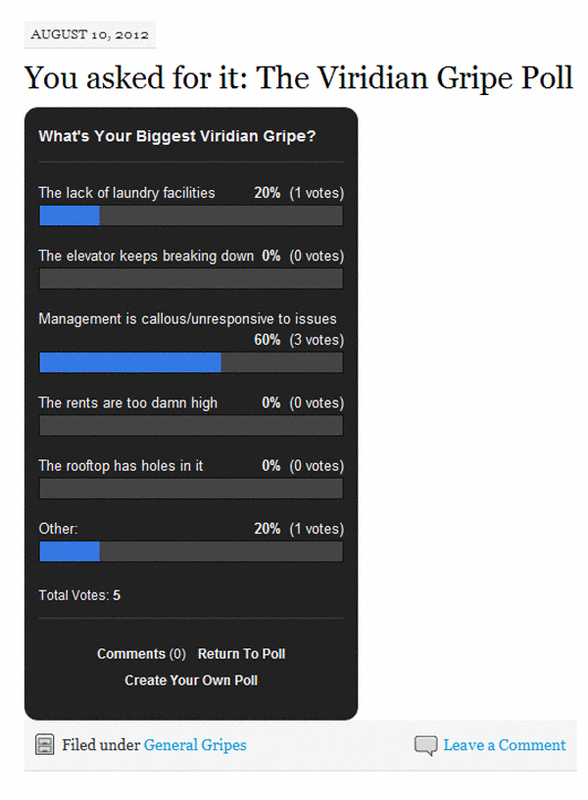 Behold, Viridian Gripes! I for one found the latest poll rather illuminating. *Not to suggest I am surprised that the “quality” of construction at this luxury building has become an issue. Most of the construction does look terrible, and the poop … well, that speaks for itself. 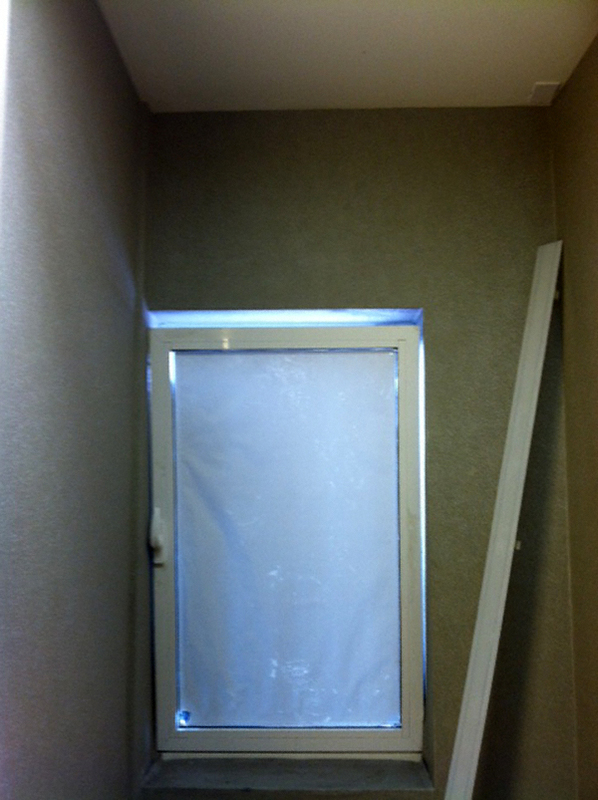 However, the window in the hallway is properly designed and installed. It’s known as a “dual tilt” window, almost ubiquitous in German homes, and has hinges at the bottom (which allow it to tilt back as shown for venting purposes) and on the side (to allow it to open fully, like a door). You can tell it’s a dual tilt because the handle is pointed UPWARD, which is the correct position to engage the bottom hinges and tilt it back. If the handle were pointed to the RIGHT, it would be openable like a door along the side hinges. If the handle were pointed DOWN, it would be locked shut. I have one of these windows in my Greenpoint home — installed after seeing them in my girlfriends’ parents home near Munich. They’re awesome!